I have lived in Seattle 25 years. This was my first time at the top of the Smith Tower. As soon as I saw the view, I knew I wanted to paint it. The view was amazing, but the best part was exclaiming over it with friends on the windy observation deck. Rosehips bordering the edge of the West Seattle Trader Joe's parking lot. I used one of my favorite photos from yesterday for this watercolor postcard. It's not always boring painting flowers. :) It was refreshing after focusing on the heavy refugee theme lately. I think I needed the break. Plus, it brought back memories. I used to paint little cards all the time. I am back to carrying around a small set of paints when I think I might have a minute to play around. I love giving myself a little challenge. What can I paint in an hour? Many thanks to all who made the reception for Displaced a huge success! Dubsea Coffee was packed. The food was amazing. The support was felt. Five paintings sold! I will post final amount raised at the end of the month. Art is on display through April 30, so if you didn't get a chance to take a look yet, you still have time! 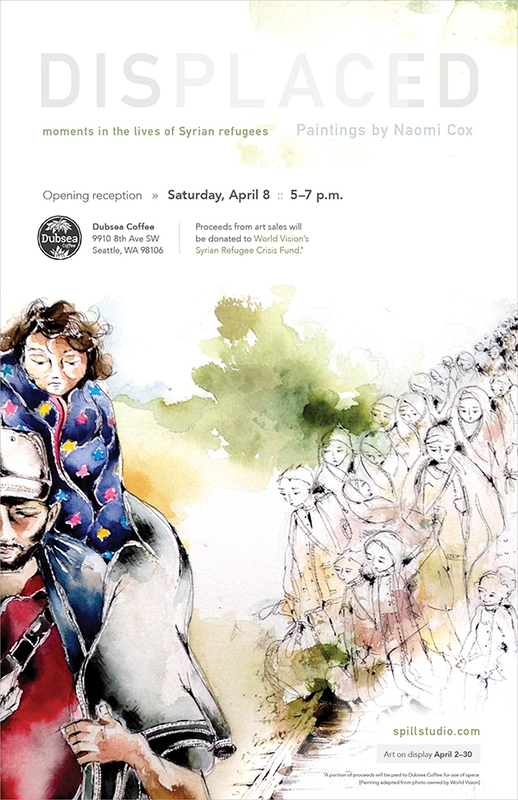 Art show opening at Dubsea Coffee :: April 8, 5-7 p.m. Learn more about World Vision’s Syrian Refugee Crisis Fund. Painting adapted from photo owned by World Vision.